Well done Linda. The power of words- wonderfully stated. Thanks for this nice contribution. 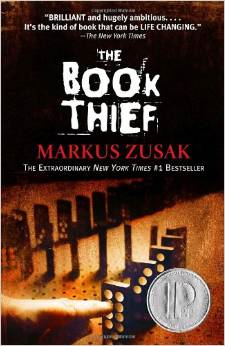 This is a wonderful lesson (and use of The Book Thief). So glad to hear that you liked it! I remember that it’s one of your favs, Emily! Now I know why! I am curious about verb tense voice here and seeking guidance. The opening sentence of this excerpt uses an active verb, slid. The ensuing sentences, however, show passive construction: we’re starting, That was when…etc. are any literary guidelines at play here? Such as, start active, then shift immediately to passive? I realize passive deserves a place in writing — “was sewn” and “were stitched”. This observation conflicts somewhat with rain. And I never understood the window — where was it?